From Knitting Daily, here is a great article with links to five summery shawls to knit. I’ve just had to turn on the a/c full-time here in Central Florida, so I’m very much looking forward to some lighter knitting! We do seem to go in phases here, don’t we? Blog post, blog post, blog post, static and silence. Usually in those quieter times, Lisa and I are going a little crazy trying to get another issue of Knitscene off to the printers and eventually into your hands. The last few weeks are no exception. Let’s just say, there’ll be a spanking new issue of Knitscene to scope out in a little more than a month. Try to contain yourselves. Colorado seemed to miss the memo that spring comes before summer, and it’s been in the 70s and 80s this week. Usually around this time of year, we’re bracing for one last snow storm, but we’ve lately been asking the skies for rain, the weather has been so dry. The evenings, though, are still cool and occasionally chilly—basically the perfect weather for a knitted shawl! Knitscene Summer is officially available at your local Knitscene retailer (and of course, online at the Interweave Store in both digital and physical editions, as well as Zinio), and inside are five shawls that are perfect to knit for those cooler summer evenings, spent sipping drinks through straws on patios. Sarah Wilson’s Westport Shawl is the ideal piece for layering over your favorite summer dress. Knit side to side, with the edging worked as you go, this is the kind of knitting that you can’t put down once you start. This is a great project for a luxurious skein of yarn or a wildly variegated colorway. The rectangular Leaf Net Stole by Kristy Howell is a great shape for summer outfits. Scrunch up this knitted stole for a skinny scarf look, drape over the arms for a more elegant occasion, or go boho and wear it as a wide belt over a summery maxi dress. I talked a little bit about Andrea Jurgrau’s Filigreen Shawl in my first post about Knitscene Summer, and I keep coming back to it as a must-knit triangular shawl. The subtle shimmer added from the beads reminds me of the quick glimpses of fireflies amongst the trees in the summer evenings. Blasé about knitted shawls after knitting tons of triangular shawls in the past? 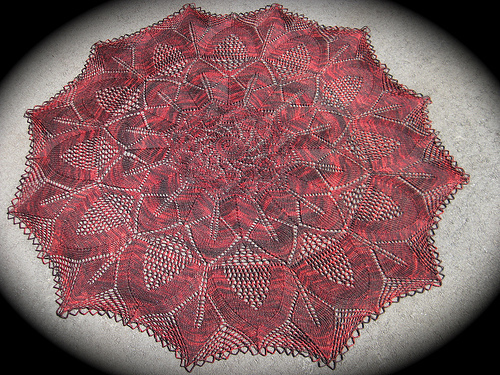 Sink your teeth into Paula B. Levy’s Ginkgo Counterpane Shawl. Sure, it’s somewhat triangular in shape, but that’s achieved through knitting individual ginkgo motifs and stitching them together. Modular knitting at its leafiest! Finally, Robin Ulrich’s Sweetgrass Triangle is the utmost in instant gratification knitting. Knit in a sport weight yarn with an open stitch pattern and simple knotted fringe edge, this knitted shawl works up incredibly fast—start one today and wear it to your Cinco de Mayo party next weekend! Don’t let your summer knitting be limited to prepping for fall—knit a shawl to wear all summer long, or any of the other patterns in Knitscene Summer, with 23 patterns to knit now. Hey, the days are longer for a reason, and I think that reason is so we have more daylight for knitting.